Vitiligo is a genetic and autoimmune skin disorder in which skin loses its natural color due to lack of pigmentation. 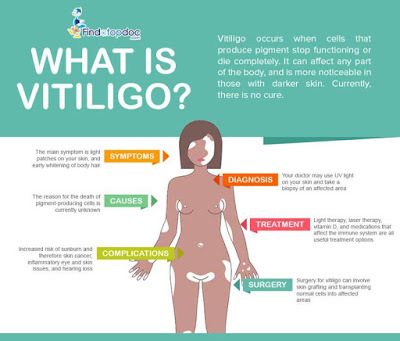 Vitiligo usually develops before age 40, and people suffering with this disorder develop white and irregularly-shaped patches on different skin areas. Vitiligo may co-occur with other autoimmune disorders, such as hypo- or hyper-thyroidism, diabetes, adrenocortical insufficiency, rheumatoid arthritis, and pernicious anemia. In most of the cases outcomes of vitiligo treatments, which mainly include strategies to restore skin color, are unpredictable and vary from one person to another. The most common treatments include drugs that affect immune system, light therapy (skin re-pigmentation), and surgery (skin grafting and micropigmentation). A combination of treatments is often very helpful to determine the right regimen for a particular patient. Alternative medicines, such as vitamin supplementation, are also very effective in treating vitiligo, as vitiligo patients often suffer from vitamin D, folic acid, vitamin B12, copper, and zinc deficiencies. To treat vitiligo, doctors generally prescribe vitamins and folic acid in combination with other treatment regimens. Vitamin B12 inhibits the production of homocysteine, a homologue of amino acid cysteine. Homocysteine down regulates the activity of tyrosinase, an enzyme responsible for melanin production, as well as generates free radicals, leading to impaired melanin synthesis and destruction of melanocytes. In this whole process, folic acid works in tandem with vitamin B12 as a methyl group donor. According to some scientific studies, a combination of vitamin B12 and folic acid supplementation and sun exposure is a good strategy to regain natural skin color. Supplementation of B12 and folic acid along with pantothenic acid, a water soluble form of B vitamins, has also shown very promising outcome in removing white patches. I am an Amazon affiliate which means I earn a small % if you purchase st no extra cost to you.